Get FREE shipping when you buy Gucci GG0113S Sunglasses from EYEZZ.com, an authorized retailer of authentic designer eyewear. 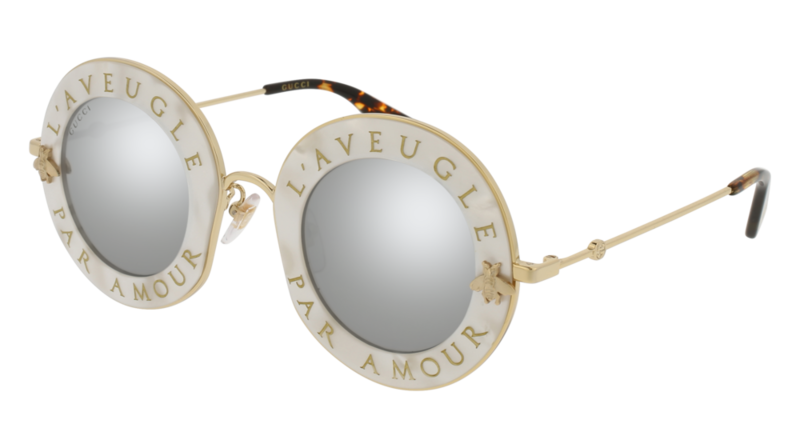 Trendy iconic round shape, characterized by the runway concept of: «L’aveugle Par Amour». Concept inspired by last Gucci runways and other Gucci categories. Acetate rim with engraved varnished sentence and iconic bee used as embelishment on the hing. DESCRIPTION Get FREE shipping when you buy Gucci GG0113S Sunglasses from EYEZZ.com, an authorized retailer of authentic designer eyewear. 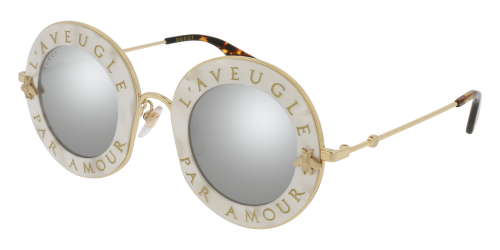 Trendy iconic round shape, characterized by the runway concept of: «L’aveugle Par Amour». Concept inspired by last Gucci runways and other Gucci categories. Acetate rim with engraved varnished sentence and iconic bee used as embelishment on the hing.